Ana Wu: Prof. Canagarajah, could you tell us your background and how you became interested in being a professor? 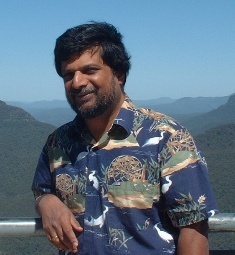 Professor Canagarajah: I am from a small island called Sri Lanka in the middle of the Indian Ocean. It used to be called the Pearl of the Orient, but is now a land of many woes (better known for the ongoing civil war, Tsunami, and poverty). I come from a family of teachers: both my parents were secondary school teachers. From my school days I loved reading. I also gradually discovered that I loved teaching (because of a shortage of teachers, older students are asked to teach lower grades in the secondary schools in my hometown). I love teaching because of the daily engagement with people (students). This is a wonderful opportunity to share ideas—share lives! I also found that this is a wonderful way to influence lives for the better. The engagement with students this way also enriched me intellectually, changed my ways of thinking, and opened my eyes to lives from different backgrounds and cultures. I am very committed to teaching: I was born a teacher; I’ll die teaching! Ana Wu: You have written various articles about NNES issues. What do you think of the label “Non-native speaker” of English? Is there anything you would like to see the NNEST Caucus do or initiate? Professor Canagarajah: The label served a purpose at one time to draw attention to those who spoke English from outside the dominant Anglo communities that traditionally claimed ownership over English. As globalization, the migration of people, and hybridizing of identities and communities become more pronounced, I don’t think the term is useful anymore. Scholars are questioning if there is anything called a pure native speaker in English. English is part of the linguistic repertoire and identity formation of millions of people from their birth. I grew up with English, Tamil, and Sinhala from my childhood. It is difficult for me to say if I spoke English or Tamil first. I can call myself a native speaker of Sri Lankan English if the terms are stretched a bit! More importantly, the positive experience of being a multilingual is perceived in a defensive and negative way when we use the term “non-native” to describe ourselves. We don’t have to be some “nons”! We can label ourselves more positively and affirmatively. Besides, in using the label “non-native” we are still giving power and meaning to the outmoded concept of native speaker. The time has come for the NNEST professionals to move from the periphery of the profession to the center. It is time for us to argue that we represent the experience that is the norm for the majority of English speakers around the world—i.e., multilinguals for whom English is an additional language in their speech repertoire and identity. It is time for us to reshape pedagogy and linguistic theories to address the concerns of those who enjoy (or those who desire to develop) hybrid proficiencies and identities as we all do. The time to be defensive, apologetic, and even confrontational is gone. There are no more battles to be fought. There is the serious task of living up to our responsibility of making knowledge that is relevant to the majority of people in the world—multilinguals. Perhaps that’s the label we have to start using—not nonnative speakers of English but multilingual speakers of English. Ana Wu: You have been the recipient of respectable awards, such as the Feliks Gross Endowment Award for the outstanding junior faculty in the CUNY system and the Presidential Excellence Award for Distinguished Research and Scholarship. What advice would you give to NNES novice teachers who are just starting their careers? Professor Canagarajah: Use your identity, background, and values to your advantage. Don’t be shy of who you are. Use your location as your starting point for your scholarship, theorization, teaching, and thinking. Draw from your own resources, there is no need to look elsewhere. Build on your roots, your family and community foundations, to make your voice heard in the profession. Ana Wu: You have continuously published articles in reputable journals, written or edited books, and given presentations at various conventions. You are also at the same time, the editor of the TESOL Quarterly, a professor at Baruch College, and a staff worker with the InterVarsity Christian Fellowship in the New York metro region. How do you manage your time? What is your secret to success? Professor Canagarajah: The secret is a balanced lifestyle. If you give enough time to the diverse commitments in life—i.e., community, friends, students, family—your work life also becomes more meaningful. Another secret is that I am engaged in the vocation with a larger vision. As a critical scholar, I am involved in teaching and scholarship because I want to change the world. I want to create a more peaceful and just environment. I want to shape moral and humane lives. This might sound idealistic, even ludicrous, to some. However, these objectives and commitments give a lot of meaning to what I am doing as a teacher and scholars. Never a dull moment! Ana Wu: Professionally, you wear many hats: professor, editor, writer, advisor and presenter. What is next for Athelstan Suresh Canagarajah? Is there any unfulfilled dream? Have you ever thought or wished you would have gone this far? Professor Canagarajah: No, I didn’t think I’d go this far. In 1994 I had just returned to my hometown in Sri Lanka from graduate studies in Austin, Texas, when I found myself in the middle of the escalating civil war. As I ducked rockets and grenades in an underground bunker in the backyard of my house, I thought that was the end of my academic career. As the conflict worsened and we experienced power cuts, break down in communication, and a censorship of books and publications, I was certain that I was condemned to a life of oblivion, cut off from the rest of the world. The rest is history or, rather, a miracle . . ! What is next? I have accepted an endowed position—the William J and Catherine Craig Kirby Professorship in Language Learning—from the Penn State University. I start working there from August 2007. Since I have mostly done undergraduate teaching up to this point, I am looking forward to more graduate level teaching and mentoring. I love the possibilities for interdisciplinary work, as I will hold this position in the departments of English and Applied Linguistics. I’ll continue to teach postcolonial literature, composition, and applied linguistics in this capacity. My dream is to generate enough resources to start a “Center for Democratizing Knowledge.” I like to gather international scholars to explore ways in which we can ensure a fair and equal flow of knowledge between the East and West. I like to bring journal editors together to consider how we can reform our publishing practices so that more research from outside North America can be published in our journals. I like to gather scholars, entrepreneurs, and community leaders to share stories on the role of multilingualism in facilitating contact between people of diverse backgrounds—and to help them take back attitudes and resources that will enable them to negotiate diverse languages with greater openness. Ana Wu: Prof. Canagarajah, the students at Penn State University are very lucky to have you. Thank you for this delightful interview and good luck in your projects! This entry was posted in Uncategorized on May 27, 2007 by AWu.